hike and paddle across Alaska. It focuses on quality, lightweight gear. The second lists additional items I had during the river portion of my journey. I was not sponsored by manufacturers. These are honest reviews. The Big Three in backpacking are your shelter, backpack and sleeping bag. That combination may weigh anywhere from 4 to 25 lbs or more. I like to go light in backpacking. Chosen wisely and used correctly, lightweight gear makes backpacking more fun. A light pack is simply more enjoyable to carry. It is also much easier on your body and can help reduce the chances of injury. Lighter packs allow a hiker to cover more miles in a day and so carry less food for a given distance. I had several bear-proof caches along the way. In these I had expendables like food, Aqua Mira, batteries for my GPS, bug dope, vitamins, medicines, toilet paper, plastic bags, maps of the stretch ahead, blank tapes, etc. Gear evaluations are always subjective. What works great for one person sometimes works poorly for another, and vice versa. It always pays to do your own research and testing before heading afield with new gear. If you see anything you think needs to be changed, please let me know. Thanks! See links above for other gear lists I used on the Pacific Crest Trail and Desert Trail, and also other lists. Stove Brasslite Turbo F < 1 oz I like alcohol stoves for solo trips. I don’t cook a lot, and only boil about a quart of water per day average. A good wind screen is important for alcohol stoves such as the setup I used on the Appalachian Trail: an MSR windscreen skewered with two tent stakes at the proper height to form a pot stand. I didn’t have one on this trip and it was my biggest packing mistake. I now favor the Caldera Cone system. Water bottle. Generic 1 Quart 3 oz. 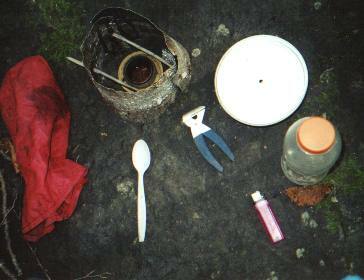 Gear I picked up and used when I reached the Noatak River. I’m glad you enjoyed it, and thanks for telling me why. If you like, perhaps you could do a review on Amazon? That is very interesting you walked the 1,000 Mile Summer route. Did you write about it? Must have been an awesome adventure! thank you for taking the time to publish all of this information.